In APx500, generator waveform files (arbitrary waveforms) can be used to create custom frequency sweeps with an equalization curve applied to the generator output level. For example, suppose that you want to test a phonograph preamplifier. Vinyl records are cut using RIAA equalization, a form of pre-emphasis on recording and de-emphasis on playback, established by the Recording Industry Association of America. Figure 1 shows the RIAA equalization curve for playback of vinyl records. To test a phonograph preamplifier, you would generate a signal with the inverse of the weighting in Figure 1. The ideal response of a preamplifier to the weighted stimulus should be flat, so it’s easy to determine deviation from the RIAA equalization curve. Figure 1. RIAA equalization curve for playback. In order to create a custom frequency sweep, you need to first choose one of the sweeps recognized by the APx500 Stepped Frequency Sweep measurement. For this example, we are using the “20Hz -90kHz 1/6 oct. (74 pt)” sweep. This waveform has a 1 kHz pilot tone at –20 dBFS, followed by 73 frequencies at 1/6 octave spacing from 20 Hz to 90 kHz (74 points, including the starting point). Step durations are 2 seconds long up to 80 Hz, and then 1 second long at higher frequencies. An equation to calculate the RIAA weighting curve may be found in Wikipedia. Using this information, we created a .wav file containing a series of sine waves (steps), each having the correct amplitude, frequency, and duration. AP Technical Support can often help you with constructing custom test signals such as this. 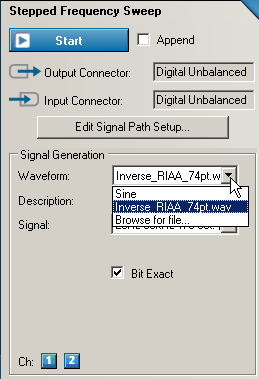 Figure 2 shows the waveform we created for this example, Inverse_RIAA_74pt.wav. 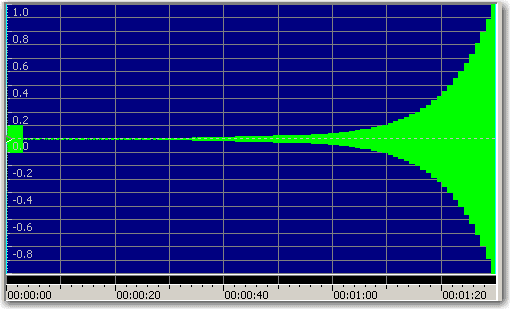 Note that the waveform is scaled to the maximum value of 1.0 FS at the highest frequency (90 kHz). To use the waveform in APx500, add a Stepped Frequency Sweep measurement to the project and select the waveform in the Signal Generation control box (Figure 3). Then, be sure to identify the signal type correctly, as shown in Figure 4, so that APx can track it. Figure 3. Selecting the generator waveform file. Figure 4. Selecting the signal type. Figure 5 shows the Relative Level result measured with Stepped Frequency Sweep using the example file Inverse_RIAA_74pt.wav. 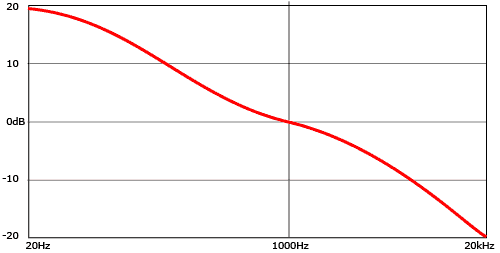 On close examination, you can see that it is exactly the inverse of the RIAA equalization curve shown in Figure 1. Figure 5. Relative Level result for the file Inverse_RIAA_74pt.wav, using the Stepped Frequency Sweep measurement.